Traditions Medical Center Phase 1 and 2. 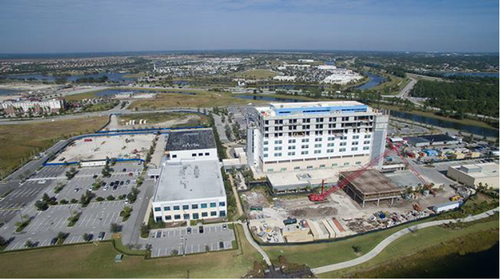 Tradition’s Medical Center Phase 1 was the construction of a 5 story hospital building. The cabling system consisted of 3,336 category 6A cables with fiber optic and copper backbone systems distributed to 10 IDF rooms back to the MDF room. Our scope included the installation of all cable tray systems, sleeves, J-hooks, communication cabinets and racks. The entire structured cabling system was tested and certified for a 25 year manufacture warranty with Fluke DTX 1800 testers. Phase 2 is the same as phase 1, category 6A cables with fiber optic and copper backbone systems for the construction of an additional 3 stories on top of phase 1, an attached data center and 2 a story hospital building.